Updated Friday March 29, 2019 by Meghan Seaberg. Welcome to all our returning and new cheerleaders to another exciting season with Sudbury Youth Football and Cheer. We are so glad that you are here and thrilled to share our Board of Directors have approved new uniforms for our squads participating in the 2019 cheer season!!! The Sudbury Youth Football and Cheer program is designed to inspire youth through teaching dedication, team work, friendship, leadership and good sportsmanship. We encourage all girls to meet each new task with a “can-do attitude” and to believe and trust in themselves, as well as each other. It is our goal to teach participants to support one another and encourage their teammates through positive reinforcement and mutual respect for their team, their coaches, and SYC. We hope to develop in your child a feeling of accomplishment and success in a fun-filled atmosphere. 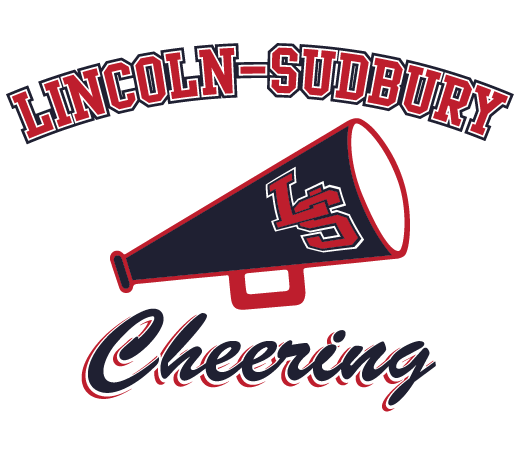 Sudbury Youth Football and Cheer strives to make cheerleading a fun learning experience with lessons that follow them far beyond the spirit of cheering. Each squad is designed to work as a team representing SYFC demonstrating their athletic abilities on the sidelines, as well as competitions. Coaches and volunteers are dedicated individuals who enjoy working with and teaching these young girls, while embracing AYC's National Philosophy. Cheer season typically begins the third week of August. This year will we begin with a 3 day cheer camp at Champion Athletix, in Hudson, MA, Followed by 1 evening of pre-season practice at LS. Our season culminates with a league competition at the end of October, followed by a few possible post season games. The season could potentially run into the second week of December, if our squads choose to advance upon winning a spot. Regular Season cheer practice is held twice a week. Regular season practices are tentatively scheduled, and subject to change on weeks with school holidays. All squads will cheer for games on Sundays beginning on Labor Day weekend. Game times vary week to week. We will travel to cheer for away games. Our elementary aged squads will cheer for the flag football teams (games lasting 1 hour), while our middle school squad will cheer for the tackle teams. We try our best to have siblings cheering for their brothers. This does not always work out, but if you have a sibling playing football, please let us know at the start of the season. *Saturday practices will be held for competing teams, when necessary. Coaches will inform you of times selected. All practices leading up to competition are mandatory! -Please send your child with adequate supply of water and bug repellent for mosquitoes and ticks when practicing outdoors. -Please be sure that there is a coach present before dropping your child off at practice. -Children must stay together with their team and must not wonder off by themselves. -Coaches must be made aware if a child leaves the practice or game area for any reason. -Please check with your child’s coach before taking your child home at the end of a practice or game. -When inside practicing, coaches will walk children out of the school, parents must be outside to receive them. It is the parent’s responsibility to be prompt when dropping off and picking your child up from practices. Our coaches are volunteering their time and must get home to their families. - SYFC recognizes that absences may occur, but please understand that if one teammate is missing, the coach must make modifications of the practice schedule. We ask that if your cheerleader must miss a practice, please contact your child's head coach (via e-mail AND text message) as soon as you know about the absence, even if it's last minute! Cheerleaders should practice in gym shorts or leggings, fitted shirt, sports bra, socks and cheer sneakers. Hair should be pulled back in a high pony tail (PLEASE do their hair before practice!). No jewelry or make-up. For safety reasons, clothing needs to be fitted. Girls will no longer be allowed to wear baggy shirts (even if they're secured with a pony tail or rubber band) or loose, bulky sweatpants or sweatshirts to practice. In the cold weather, we recommend compression pants and compression shirts or fitted leggings and fitted jackets. For safety reasons, all girls are now required to wear cheer sneakers. Order information will be available as soon as registration closes. Cheerleaders are required to arrive at Games in full (clean) uniform. This includes bow, skirt, vest, body suit, spanks, cheer socks and white cheer sneakers. - Hair should be pulled back in a ponytail. - Arrival time will be determined by the head coach. This will vary week to week. As we prepare for competition, practice intensity increases. It is not mandatory for all cheerleaders to compete. If a cheerleader has other obligations and cannot make practice on a regular basis, a decision can be made by the parent and/or coach that it may be in the best interest of all for the cheerleader not to compete. Cheerleaders are required to arrive at Competition in full (clean) uniforms. Coaches will be in touch with further details regarding what the girls will need. -Hair (including bangs) MUST be pulled back in a tight high ponytail. Absolutely no jewelry! This means; no earrings, necklaces, finger rings, body piercing, etc. - Any nail polish (including clear) is prohibited. If your child has newly pierced ears, the earrings need to be covered with athletic tape or Band-Aids. - Please send your child with adequate supply of water and money for snacks. Your child will be given a skirt, “shell” and bodysuit (sleeves) at the start of the season. We will also provide a bow for your child to wear to all games and competition. Children may keep the bow, but the rest of the uniform is on loan from SYFC and should be treated as such. Parents will need to provide; white sneakers, red spanx and cheer socks. Your child’s coach will provide ordering information for these items prior to the start of the season. The squad needs to look uniform, so there will be specific ones to purchase and where to purchase them. Uniforms are the property of Sudbury Youth Football and Cheer and are NOT to be worn and used outside of the league sponsored functions (i.e. Halloween, school etc.). Please ask your child to be extremely careful when eating and drinking while in uniform. Families are responsible for keeping uniforms clean and in good condition. Uniforms can be hand washed and air dried, DO NOT PUT IN DRYER OR IRON.